In November 2012, I invested $10,000 into person-to-person loans split evenly between Prosper Lending and Lending Club, looking for high returns from a new asset class. After diligently reinvesting my earned interest into new loans, I stopped my after one year (see updates here and here) and started just collecting the interest and waiting see how my final numbers would turn out at the end of the 3-year terms. My last update was 4 months ago, so here’s what things look like after 19.5 months. $5,000 LendingClub Portfolio. 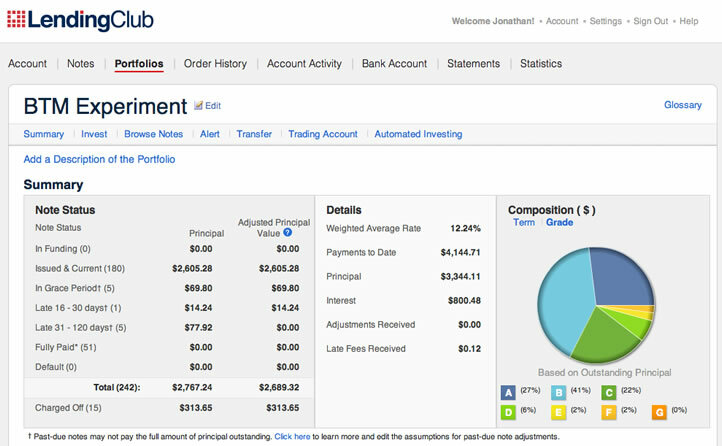 As of June 15, 2014, the LendingClub portfolio had 180 current and active loans. 51 loans were paid off early and 15 have been charged-off ($314 in principal). 6 loans are between 1-30 days late. 5 loans are between 31-120 days late, which I will assume to be unrecoverable. $2,679 in uninvested cash (early payments and interest). Total adjusted balance is $5,368. $5,000 Prosper Portfolio. My Prosper portfolio now has 157 current and active loans, 78 loans paid off early, 23 charged-off. 6 loans are between 1-30 days late. 6 are over 30 days late, which to be conservative I am also going to write off completely (~$89). $2,434 in uninvested cash (early payments and interest). Total adjusted balance is $5,322. The fact that institutional investors are buying a significant portion of Prosper and LendingClub loan inventory would seem to prove that the concept is successful. 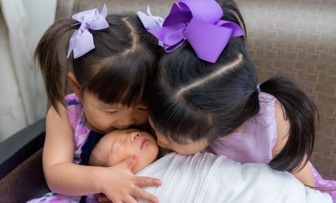 If I were to invest all over again, I would do it within an IRA to avoid tax headaches. I would also buy at least 100 loans x $25, which also happens to be the $2,500 minimum for free auto-investment at LendingClub (no minimum at Prosper). But simply put, I am not in love with P2P loans enough to allocate my precious IRA space to them. My total adjusted balance is $10,690, which actually shows a slight recovery from my last update in which my total balances were actually dropping. At least I’m still headed to a final balance higher than a savings account. My idle cash is starting to pile up though, so I will take $2,500 out of each account soon and put it elsewhere. 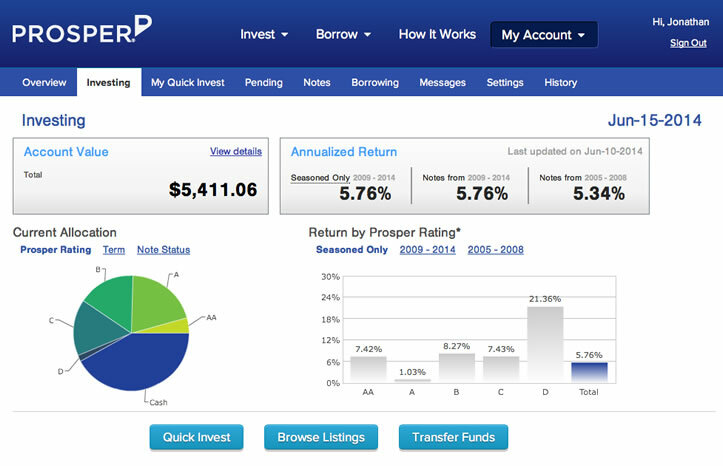 Prosper says my annualized returns are actually 5.76%. But just 4 months ago, they said I was earning 7.55%. The lesson here is that your returns will continue to vary and likely deteriorate as your loans age, so don’t assume your returns will always stay the same as they are in the beginning (your returns will look good for a long time if you keep reinvesting into new loans). LendingClub says my annualized returns are now 5.94% (5.24% if you assume all loans 30+ days late will be total losses). Not awful return numbers so far in this low-interest rate environment, but less than I would have hoped for. Not exactly exciting returns there. Will you stay with either after the 3 year terms? Having a tough time thinking P2P lending would be better than a diversified portfolio of stocks & bonds. Both for overall returns and tax complications. thanks for the insightful analysis. jumped into Prosper back in 2007 and experienced massive writeoffs. might give Lending Club a go this time. So if I understood correctly, in write offs you lost the principal as well, correct? or was there any backup so that you managed to recoup the principal and just lost interest? nah, lost principal too in quite a number of cases. lots of borrowers made one payment (prosper loans were for 36 mos) and then disappeared. Prosper was banned for a while from making new loans after that. on a related note i just got a check for $68.05 due to settlement of a class action law suit against Prosper. didn’t even recall joining. oh well, a small consolation.